You’re curious about how much it costs to move to Thailand? You’ll get your answer in this article, along with valuable insight into the daily cost of living here. 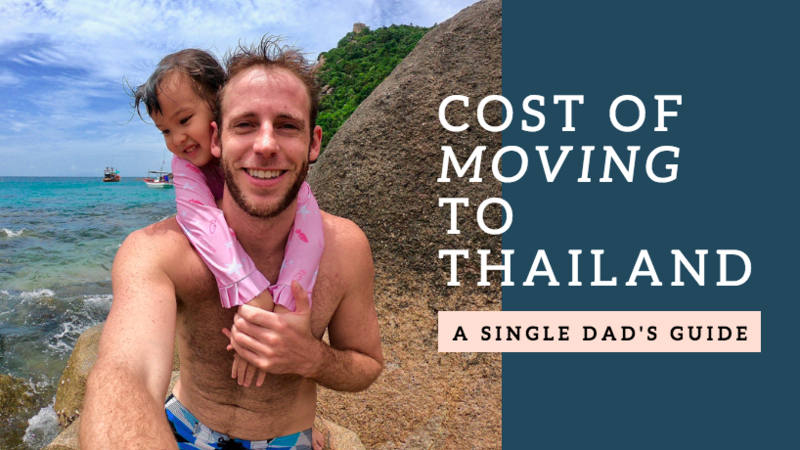 I’m in my tiny house in Thailand right now, and in this article, we’re going to talk about exactly what it cost me to move to Thailand and what you can expect if you’re looking to move here, too. The first thing you have to worry about when you’re considering moving to Thailand is getting a visa to move there. Most of the time you can get a tourist visa for 90 days tops. There are other ways, say by taking Thai language lessons or taking Muay Thai lessons (receive an ED Visa), that you can stay longer for a year or even longer, but most of the time a lot of digital nomads are going to live there for three months on a tourist visa. If they want to stay longer without the ED Visa, they’ll just have to exit the country and come back in with a new visa. So how much do these tourist visas costs? The first time you apply for one it’s going to be $40, and that’ll get you into the country for up to 60 days. And then while you’re inside Thailand, you’re going to need to go to the immigration office to extend that visa another 30 days to get the full three months, and that will cost you an additional $60. So in total, visas in Thailand for three months are going to cost you $100. Very important. You got to get a flight to Thailand. Now, how much is a flight to Thailand going to cost you? It really depends on where you’re from. I was coming from Hong Kong, so my flight cost me less than $100, but I’ve flown to Thailand from the United States, and it cost less than $500 to fly one way to Thailand. When you finally land in Thailand, you’re going to want to connect your phone, so you need to get a SIM card. You can do this inside of the airport, there are multiple places to do it. If you’re going to connect, just connect right away. Get a SIM card, get a month set up. Anywhere with a sign that says ‘telecom’ or ‘mobile repair’ will have a SIM card for you, no reason to shop around, it’s all same-same, as the Thai people say. It should cost you no more than $15 for unlimited data. You’ve got to get to the city center. How are you going to get there? You can take mopeds, buses, trains, et cetera. I usually take a taxi. It’s just the most convenient way to get there, and it usually doesn’t cost any more than about $15 to get to the middle of the city. If you’re not planning on living in Bangkok, and you’re going to be headed somewhere else, maybe just take a day to rest there at least. I recommend just finding a hotel. There’s a really nice one that I enjoy down Khao San Road. It’s called Rambuttri Village Inn and Plaza. It’s a really nice place. It costs anywhere between 20, 30 dollars for a night. It’s got a couple pools on the roof and it comes with breakfast included, so check it out for under $30. The next day, if you’re like me, you’re headed down to the islands. Now you don’t have to go to the islands. You could head north; there’s plenty of countryside to see. I’m just going to give you an example of headed down to the islands because that’s where I’m living. So getting from Bangkok down to the islands, you got to get on either an overnight train which can cost you $50 to get down to the islands. Or you can get on a bus that will take you to a boat, and the boat will take you to the islands as well. Cloudy day, but the island is still nice to look at from the boat. A bus/boat combination ticket to the island will cost you $30. Once you’re finally on the islands, you’re going to need to be able to get around because you have to find your accommodation. Too expensive for my tastes, I prefer having my own transport. You don’t want to take the taxis here; the taxis are going to cost you five, six dollars each way, no matter where you go. So the first thing you can do is try to find yourself a motorcycle. You can rent them pretty easily anywhere in Thailand for less than, say, $75 a month, sometimes $60 a month. Usually people pay about $100 a month to rent a moped or a scooter or a motorbike. I straight up recommend buying one once you get here, and then sell it on Facebook a day before you leave to make your money back. Bike rental shops are everywhere, but so are bikes for sale, just look at local Facebook groups to find heaps of them. Just buy a bike for anywhere between $300 to $350 for a decent set of wheels. If you’re going to be driving around that bike, it’s going to cost you no more than $10-20 tops, if you’re living on the islands, per month for the petrol you’re going to be using. It cost nothing. It’s so cheap. Once you got your bike and you got it filled up with gas, then you got to find a place to live. For the accommodations on the island in Thailand, they range anywhere from private little bungalows on the beach to huge villas with private pools of their own up in the mountain tops. So no matter what your budget, you can find a place. Some houses look like this in Thailand. JK, this is a temple. The cheapest I’ve seen on the islands is about $150 a month, and that can go all the way up to the thousands. If you’re like me and you got kids, I’m sending mine to a school here. That school is a full time, five days a week. Goes about 8:30 to 4:00 in the afternoon. They’ve got a great international curriculum. They teach Thai lessons to the children as well. It’s a fantastic school. It costs about $300 per month. If you’re a single person, eating in Thailand can be so, so cheap. You go out to the restaurants, you can get a meal for a dollar or two, and that’s every single meal. You can go more expensive than that if you want to, but you don’t have to. One of my favorite Thai restaurants on Koh Tao. The owners are really nice and the food is so good! Say you go out and you spend $2 every meal, three meals a day should fill you up. You’re going to spend no more than $180 per month on food. Your laundry’s going to be super cheap. You drop it off at the laundry shop, you give them a dollar or two. They’ll have it clean for you the very next day. Cheap laundry! And it’s done for you, which is nice. Laundry for myself and my daughter each month costs no more than $8 per month. You’re going to need fresh water, and you don’t want to be buying those tiny little bottles over and over and over again that are polluting our oceans. Get one big bottle, get it for about $4, and you can head in and refill it whenever you need to for about $0.66. If you’re living in Thailand, you want to make sure you have good travel insurance. There’s risk of food poisoning if you eat street food, there’s also risk of getting into a motorbike accident. Those things aren’t exactly safe all the time, so you want to have good insurance here. The healthcare system is quite solid, but having good insurance to back that up will keep you safe. That costs a single person about $85 per month. Total: How Much Does it Cost to Move to Thailand? With all that added up, what is the final tally of the cost to move to Thailand? Now, I’m going to include the first months costs just because I believe that’s part of moving somewhere, is that that first month you’re going to have a little bit higher budget. Taxi to the city center, about 20. One night in Bangkok, 25, 30 bucks. Getting yourself to the island, 30 to 50 bucks. Buy your first motorbike, $300. Fill it up with gas for the month, 20 bucks. Get your bungalow or room rented, about $240. Your food’s going to be about 180 bucks. So all that added together, it’s not going to be any more than about $1,500 to move to Thailand, to pay for that first month and all accommodation, transportation, food, et cetera. That’s how much it costs to move to Thailand! It’s not that expensive, and once you’re here, the cost of living is so much lower than where it is, say, in the United States, that any hurdle it takes to get here is going to be offset within the first month or two. You’re going to make that money back just on your cost of living alone. So if you’re looking for an awesome place to move to with some great food, super nice people, and fantastic weather and places to live, then Thailand should be on the top of your list. If you found this article helpful, please SUBSCRIBE to the mailing list below to stay informed and receive awesome offers on my upcoming books.